Home » Celebrations » Fancy Football…Is that a thing? Fancy Football…Is that a thing? Okay, I’m NOT a football fan. But, before that turns you off from me and my blog, give me a chance. 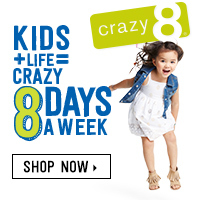 I really don’t like it, I don’t understand it, and dislike it enough to go severely A.D.D. on anyone attempting to explain it to me. However, my friends and every significant other I’ve ever had LOVE football. 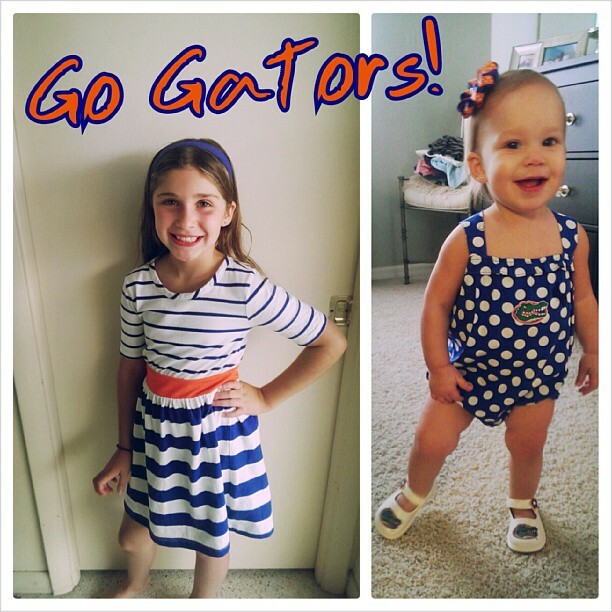 This includes my husband who is a die hard Gator fan…evidenced by our girls. And please don’t judge if you hate the Gators. Lest I remind you that I am NOT a fan. Of any team. I live in a perpetual state of confusion during football season and secretly dream of re-purposing the football with craft scissors for a set of coasters. Or something. Life would rock if we could sit around and drink beer on Sundays (or Saturdays) to cheer (or boo) at each other while throwing popcorn and successfully (or not) sewing a tablecloth. Or something. Just sayin. Now, despite my disinterest in the sport, I’ve hosted a handful of football get-togethers over the years. Since my husband gets excited and I lose him for a day when the Gators play (because he apparently goes deaf and blind to anything that isn’t coming out of the television), I decided that I’d make those days enjoyable for him by doing fun things I like…like trying new recipes or crafting up something silly. Anyway, I just wanted to share one fancy crafting idea that would add a little panache to any size gathering you have and one of my favorite foods to enjoy during a game. 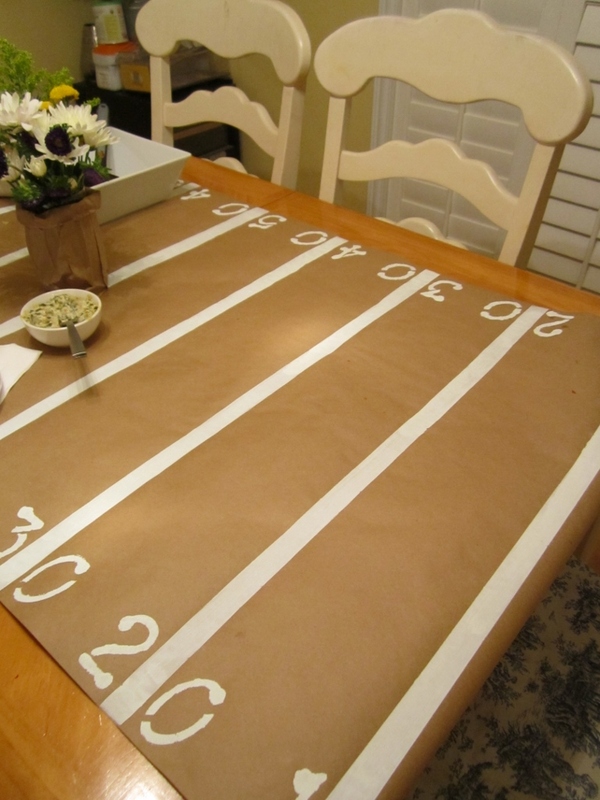 After seeing something similar in a magazine ad, I whipped up this tablecover from craft paper, stencils and paint. And no, I don’t generally do this sort of thing just for my family of four. The in-laws were coming over for the big game. I bought purple and yellow flowers to use as a centerpiece to match the team we were “rooting” for. I have no clue what team that was. Bygones. It was a fun project to do with my daughter, who was around 7 at the time. I apologize for the lack of pretty pictures but helpful (and hungry) family occasionally gets in the way of photographing my crazy behavior projects. The nerve, right? I also impressed my friends by simply knowing what the actual numbers were supposed to say on the yard lines. See there. I’m not so bad. I will feed you in fancy surroundings even though you can’t see, hear or feel what I’m doing. As for food, I’ve done everything from store bought sandwich platters to a giant pot of chili to grilled anything. But our favorite thing to eat on any gameday (with or without guests) are these Chicken Kebabs with Creamy Pesto Dipping Sauce from Cooking Light. They’re a meal on a stick, easy to eat while someone is screaming at the television, super tasty and best of all…HEALTHY! We usually just eat these as is but they would be great combined with a plethora of other party pairings. We always say they’d be great on pita bread with the yummy sauce dripping down your face but then we decide to stick to the lighter version, sans bread (so we can eat chicken wings the next day). 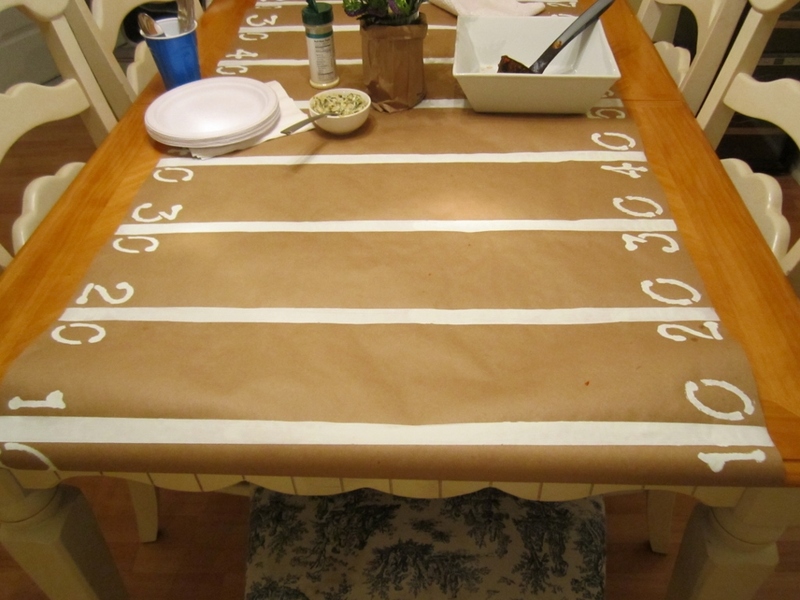 I’d love to add the teams to the next football field tablescape I make. Any other suggestions? 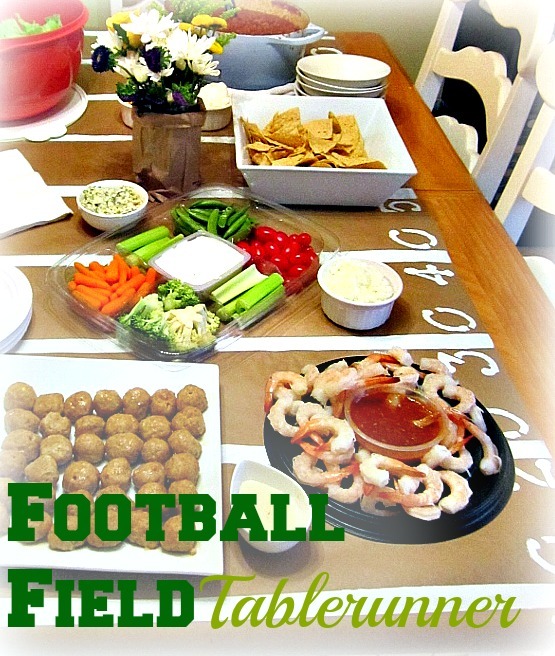 In the meantime, I will do my best to come up with some other football friendly posts for those of you that DO actually enjoy the sport and want to fancy up your gatherings…and I’d love to hear your favorite football foods and decorating ideas!